Sean P. Burrus is the Andrew W. Mellon Curatorial Fellow at the Bowdoin College Museum of Art. He received a Ph.D. in the History of Judaism from Duke University (2017) and holds an M.A. in Religion from Duke (2012) and B.A. in Ancient Mediterranean Religions from the University of North Carolina (2008). His research explores the role that material and visual culture played in the Jewish experience of late antiquity. 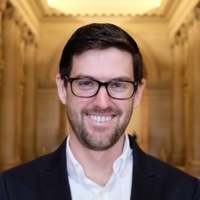 Sean was recently the Bothmer Fellow at the Metropolitan Museum of Art in the Department of Greek and Roman Art, where he completed his dissertation on sarcophagus sculpture and Jewish patrons in the Roman world. Sean has recently begun research on a new monograph more broadly exploring the diaspora experience in the late ancient Mediterranean through a series of case studies across different media, including mosaics, wall paintings, and marble. Robyn Le Blanc is an Assistant Professor in Classical Studies at the University of North Carolina at Greensboro specializing in the archaeology of the Roman provinces, mythology, and ancient numismatics. She received a Ph.D. in Classical Archaeology from the University of North Carolina at Chapel Hill (2016), an M.A. in Classical Archaeology from the same institution (2011), and a B.A. from the George Washington University (2008) where she majored in classical humanities, archaeology, and history. 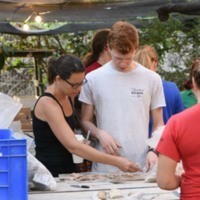 Robyn has excavated across the Roman world, from England to Israel, most recently as a field staff and publication project member on the Leon Levy Expedition to Ashkelon (Israel). Her current research explores the material role that mythological traditions and imagery played in articulating collective identities and creating connections between cities and peoples in the Roman provinces, especially on civic coinage. We've been very fortunate to welcome several student contributors to the project. They have contributed in a variety of ways, from inputting entries, to creating online exhibits, and writing guides to individual artifacts or groups of entries. WIRE is built with Omeka through ReclaimHosting, and is hosted on ReclaimHosting servers.